Your sister will be thrilled to receive this personalized sweatshirt as a gift from you! 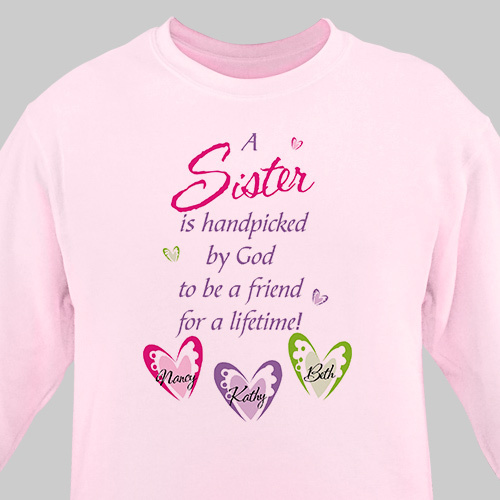 She'll love lounging around with her family, friends and, of course, sisters in one of these Personalized Sister Gifts showing your special bond. Our Gifts for Sisters are available on our premium white, pink and ash gray cotton/poly blend sweatshirt, machine washable in adult sizes S-3XL. Free personalization of up to 6 names is included. Turned out better than I had hoped. Will definitely be ordering more in the future. Give your sister this sweatshirt for a birthday gift or simply because you want to show her you care. She'll love that you gave her something that shows how much you love and care about your special bond as sisters. If she loves this shirt, then she might also like our Personalized Sister Mug.